Have a blast learning new techniques in our hands-on team sewing environment. A brand new full color catalog, an exclusive $500 value CD with 9 design collections, plus the event projects and more, with a tutorial book! All for a total value of $699 for just attending. This entry was posted in anita goodesign, Machine Embroidery FYI, Upcoming Events and tagged anita goodesign, embroidery on December 26, 2014 by Designs by Marje. 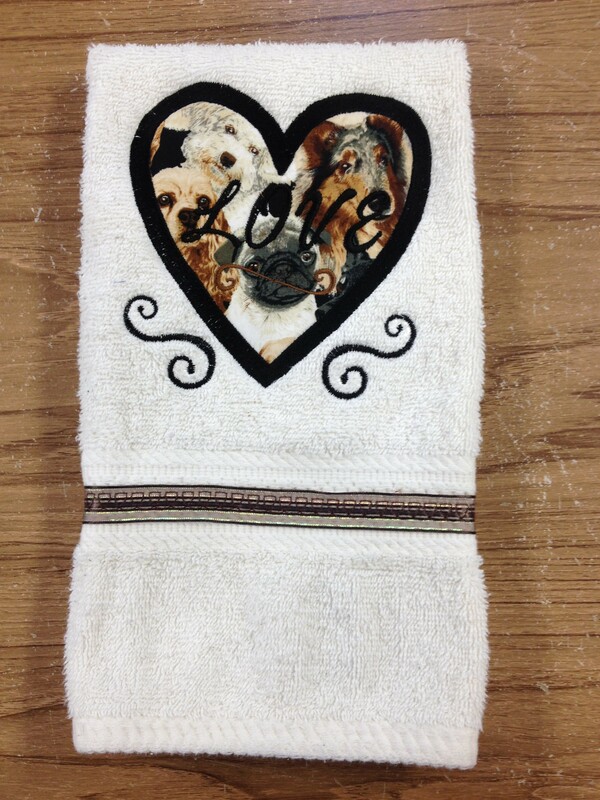 Embroidered towels look great in your powder room or bathroom. They also make great gifts for showers, weddings, house warmings, birthdays, or the holidays. 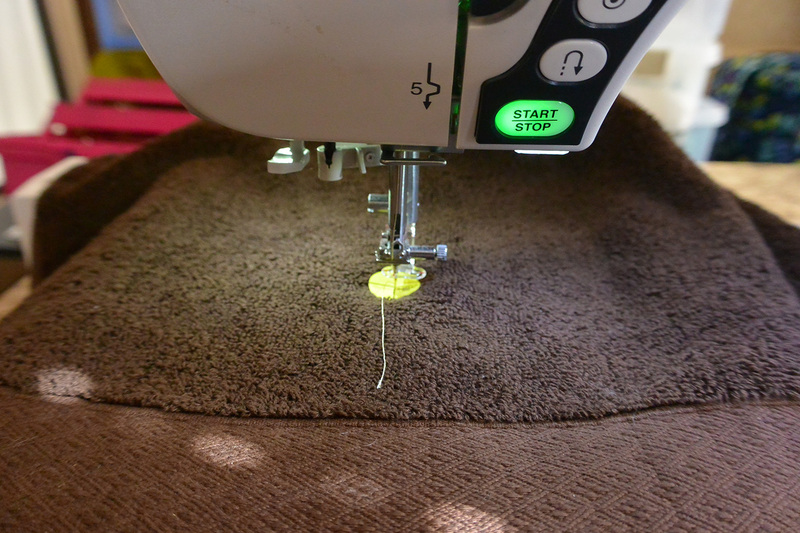 It is easy to embroider the towel if you follow a few easy steps. Look at your towel. Most towels have a band on the front, and some on both front and back. Usually, there is a label on the back of the towel. Your embroidery should be on the front. 1. 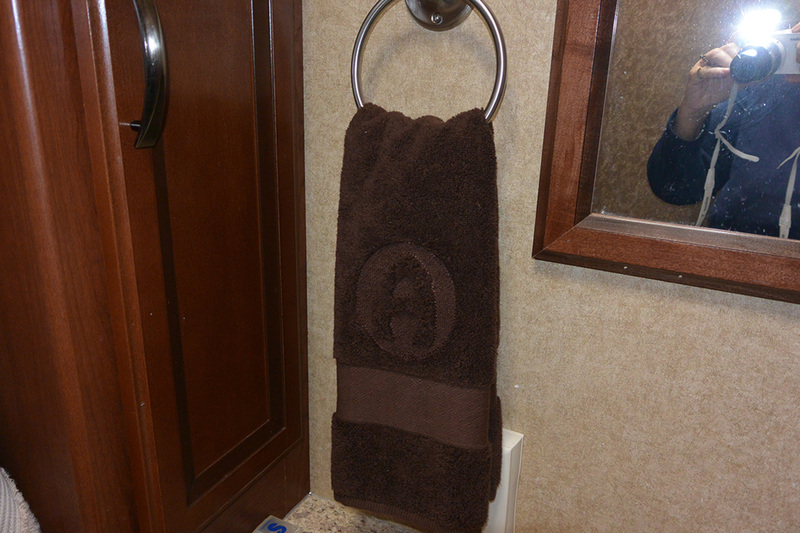 Measure the width of your towel. My towel is 15 1/2″ wide. 2. 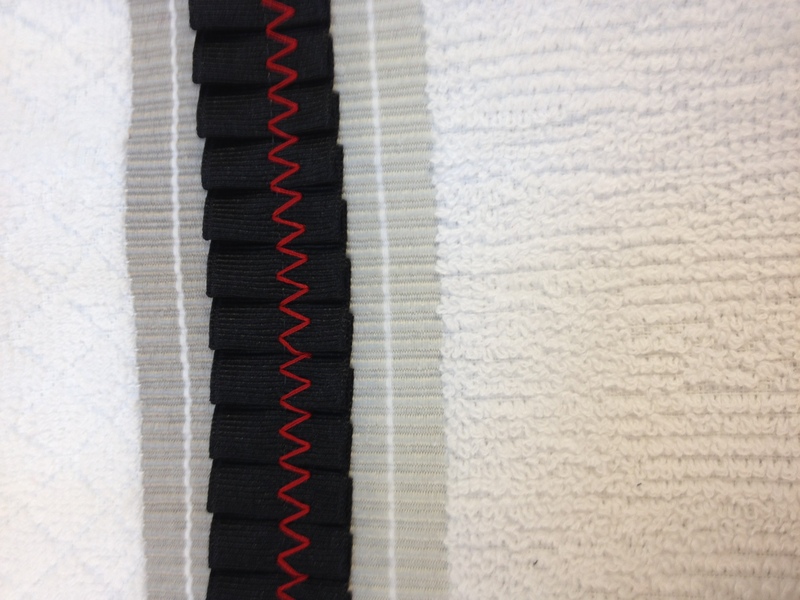 The bottom of the design is placed 1/2″ – 1″ about the band, if the towel has one. 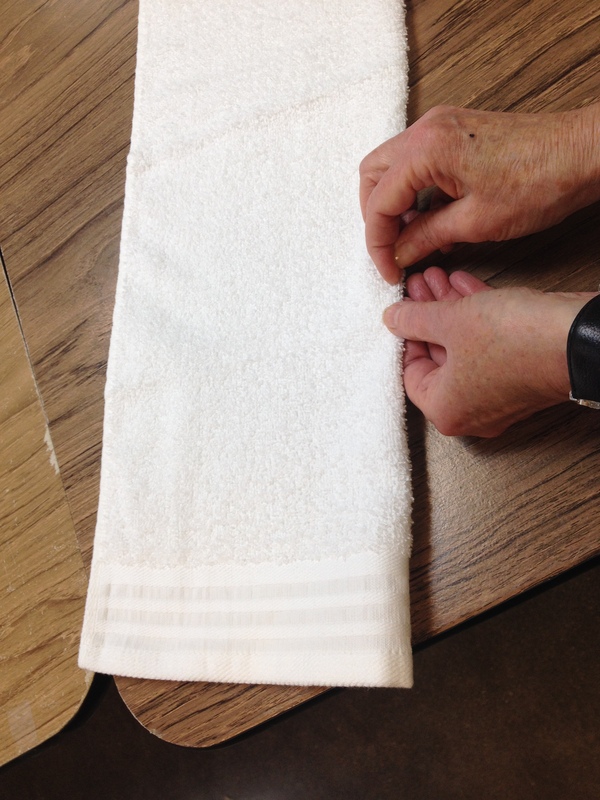 If the towel does not have a band, place the design about 3″ from the bottom of the towel. Since my design is 4 1/2″ high, the middle of the design is 2 1/4″. My design is 1/2″ above the band. Measure 2 3/4″ above the band and mark with a + or use a positioning sticker. You can mark your placement with a water soluble pen, air erasable pen or friXion pen. The center of the + is where the needle should penetrate the towel before starting the embroidery; the + lines show vertical and horizontal alignment. Note: Don’t use a water soluble pen, if you use heat n’ gone topping. The use of an iron will permanently set the mark. 3. Always use the smallest possible hoop for your embroidery. 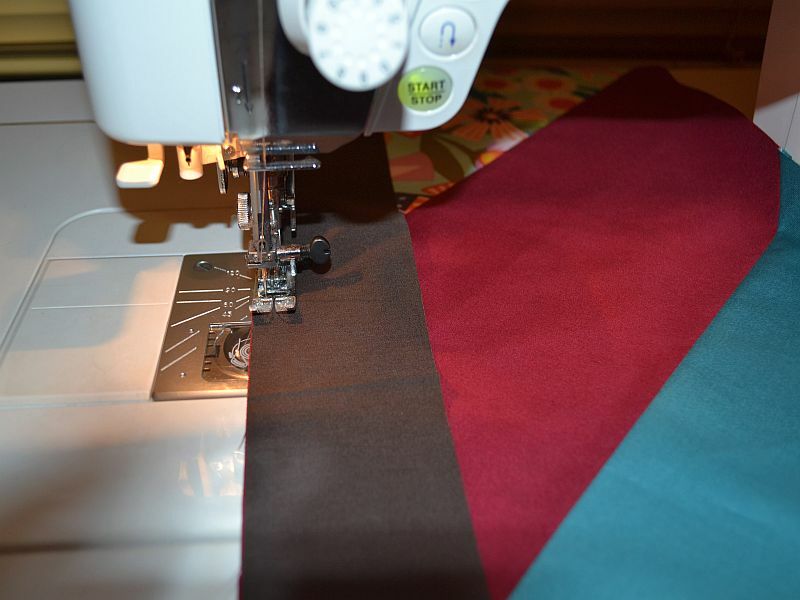 It saves on stabilizer but more importantly, provides better stability during embroidery. I like to use Floriani Stitch and Wash Tearaway. Cut a piece of stabilizer about 1″ larger that you hoop. Place it in the hoop and tighten the hoop screws so that it is taught. There is no need to over tighten the screw. 4. Lightly spray the stabilizer with temporary spray adhesive. I like 505 because it does not leave a sticky residue on my needle when embroidering. Stray by putting your hoop into a box or trash can to minimize spraying all over the place. 5. Select a thread color similar to your towel. Wind a bobbin with the same thread so the back of your towel is not covered with white bobbin thread. If you embroidery machine uses a different bobbin case for embroidery change your bobbin case. Insert the bobbin and thread your machine. 6. Turn on your embroidery machine and open your design. 7. Place the towel on the hoop. 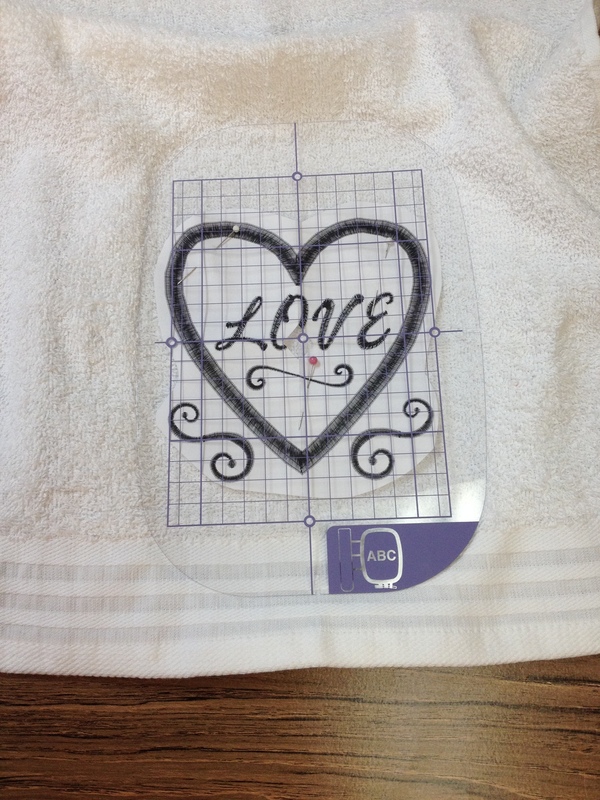 Use the template that came with your embroidery machine to position your towel in the middle of the hoop. Reposition the towel if necessary. 7. Place the hoop on the embroidery machine. The design should be near the center of your hoop. Move the design around as needed. 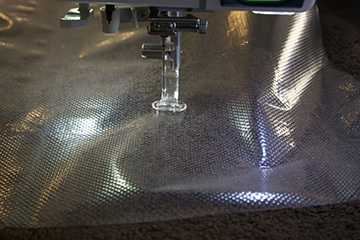 Lower the needle so that it penetrates the embroidery mark or sticker. Raise the needle. 8. Remove the position sticker if you used one. 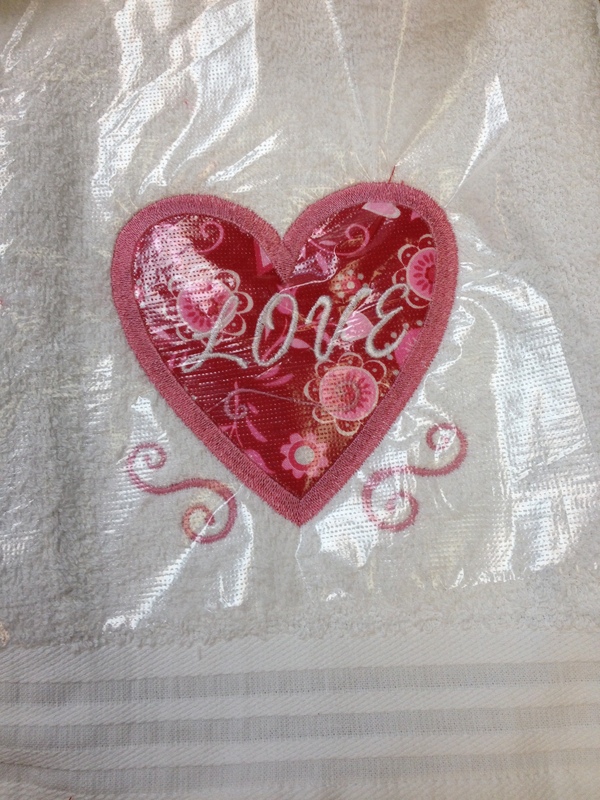 Place a water soluble topping or heat n’ gone on the embroidery area. 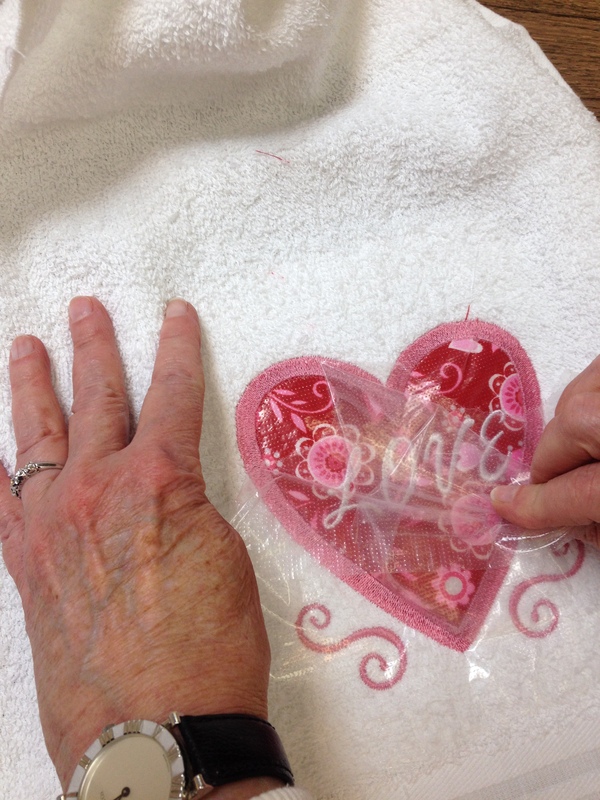 Use a piece of Floriani Pink Embroidery Tape to hold the topping in place during embroidery. I sometimes use blue painters tape to hold the topping in place. 9. Embroider the design. Remove the towel from the hoop. Tearaway as much stabilizer from the back as possible. The remaining will wash out. Pick water soluble stabilizer from the top. Use a spray bottle to remove stubborn parts. Use an iron to remove heat n’ gone. This entry was posted in Home Decor, Machine Embroidery FYI, Project Tutorials, Uncategorized on December 12, 2014 by Designs by Marje. As I mentioned, I am traveling in our RV. Maybe traveling is not the appropriate word at the moment, since we are spending the next 3 months in Clermont, Florida. We are a few miles from Disney World which has been one of our favorite places for many years. My sister-in-law came to visit from New Jersey. She is staying for 2 weeks. She enjoys sewing as much as I do, but has not done any machine embroidery. In our travels to the local quilt shops, we sa w a towel with an embossed letter. I told her that I could make that. 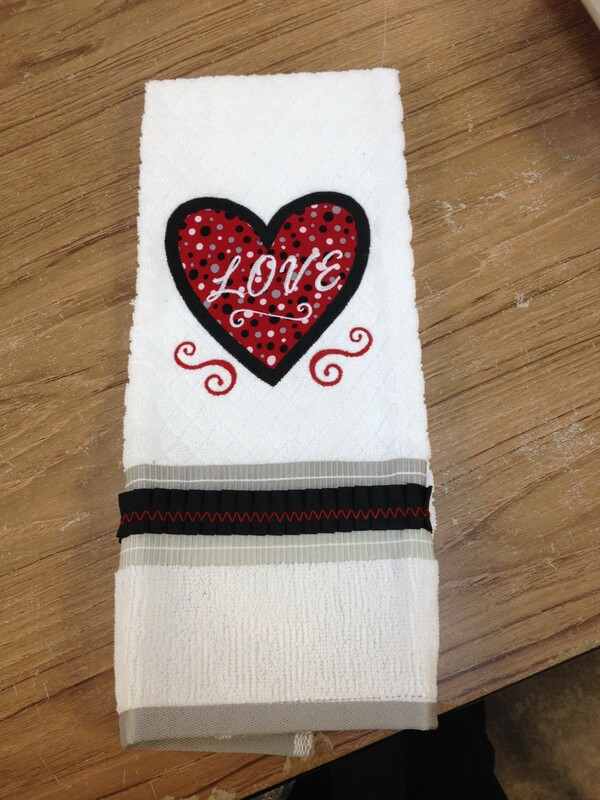 So we bought hand towels to embroider. I bought one. We don’t need many in the RV. Rose bought six, 2 for each of 3 daughters. Back at the RV, I created the “embossed design” using Florian Total Control/U. 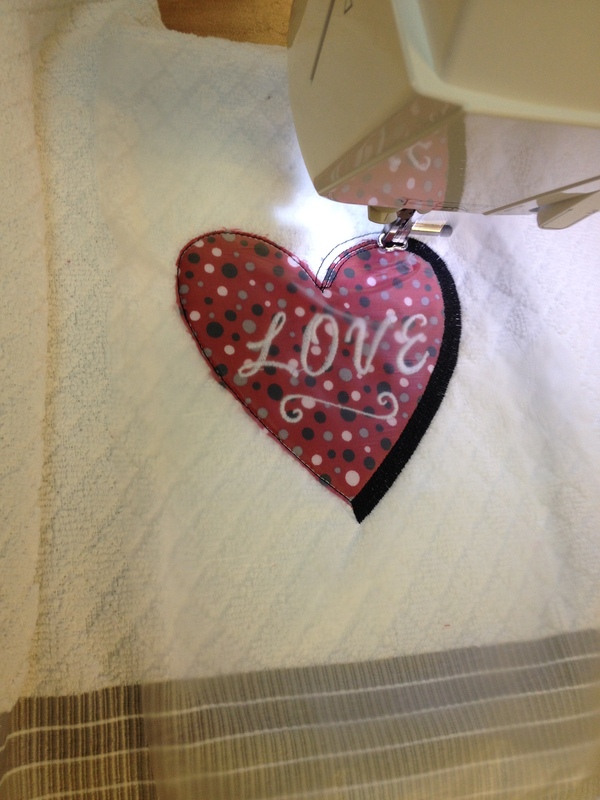 I had 4 designs to create, A, G, F, and V.
I embroidered the towel using my Janome 9900. Below is a link for the instructions on how to create the monogram using the Floriani Total Control/U software. 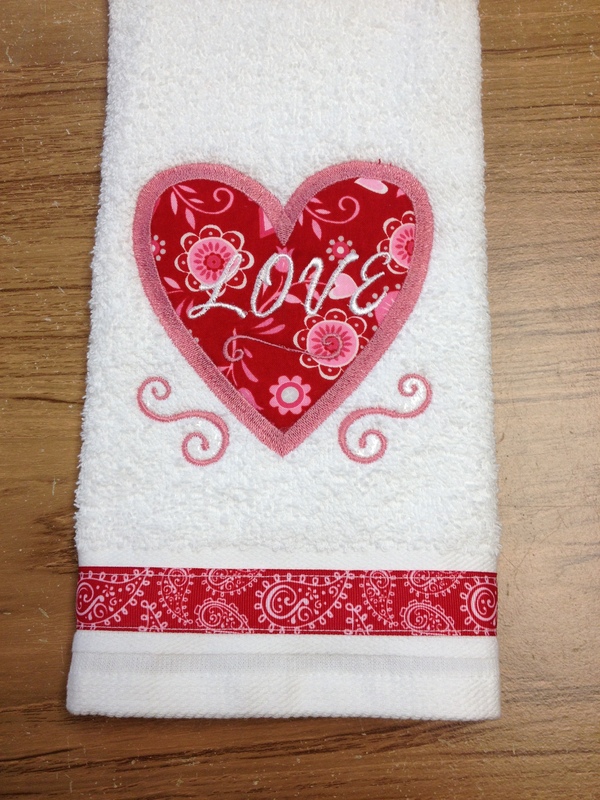 Next post: Instructions on how to embroider the towel. This entry was posted in Home Decor, Machine Embroidery FYI, Project Tutorials and tagged digitizing software, embroidery on December 9, 2014 by Designs by Marje. 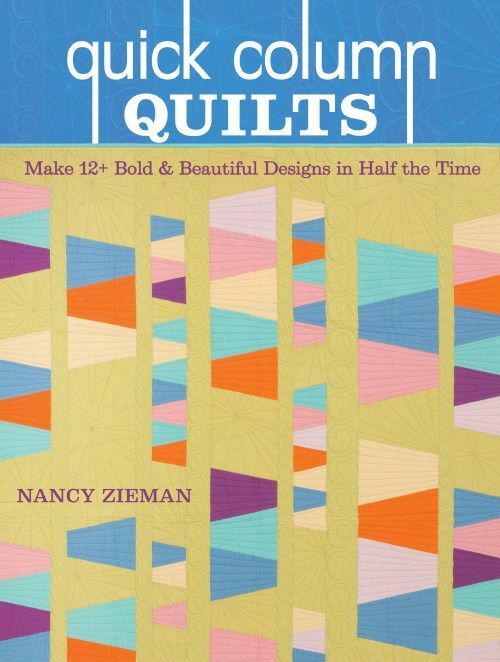 We are Part of Nancy Zieman’s Quick Column Quilts Blog Tour!!! Yay! Be sure to keep reading so you can see which quilt sample I chose to make from Nancy’s AWESOME new book! Drum Roll, Please! ……………………………………. This week, I’m taking part in Nancy Zieman’s Blog Tour to help get the word out about her latest book. 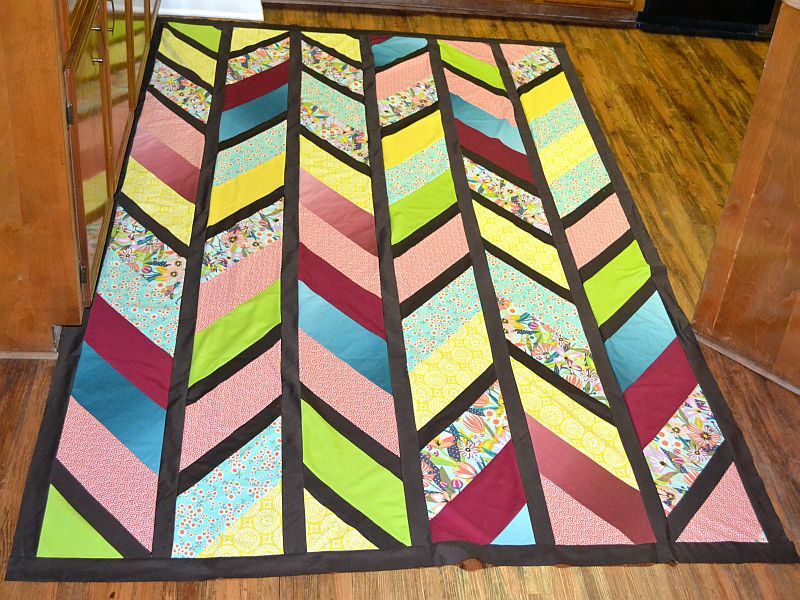 Let me tell you, it’s FULL of great quilt projects that will delight the novice to the expert quilter with it’s easy to follow instructions and tips. You are definitely going to want your own copy of this one! Enter to Win a FREE Copy of Nancy’s Newest Book!!! Would you like a chance to win a free copy of Quick Column Quilts? Just leave a comment on this blog post and a random winner will be chosen from the comments at the end of Nancy’s blog tour on Sept. 17th. We will ship your book to you once we receive our copy from the publisher! First, I had to decide on which fabrics to use. I got these fun prints from my designer friend, Erin Schlosser. 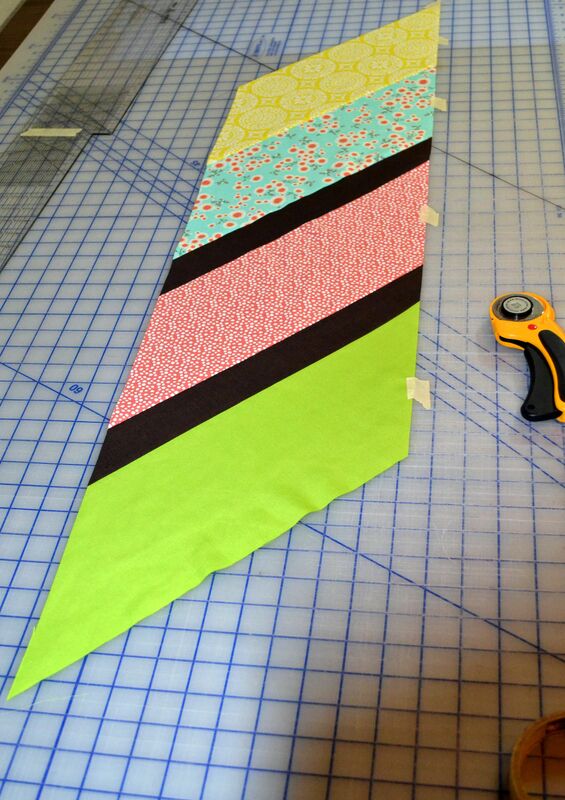 Then I had to cut the fabrics into strips as directed in the handy dandy instructions. Part of my Downstairs Strips! I love those big,colorful flowers…. Once my strips were sewn together, I followed Nancy’s very clear instructions for cutting my “Stairs” into what would become the chevron columns. 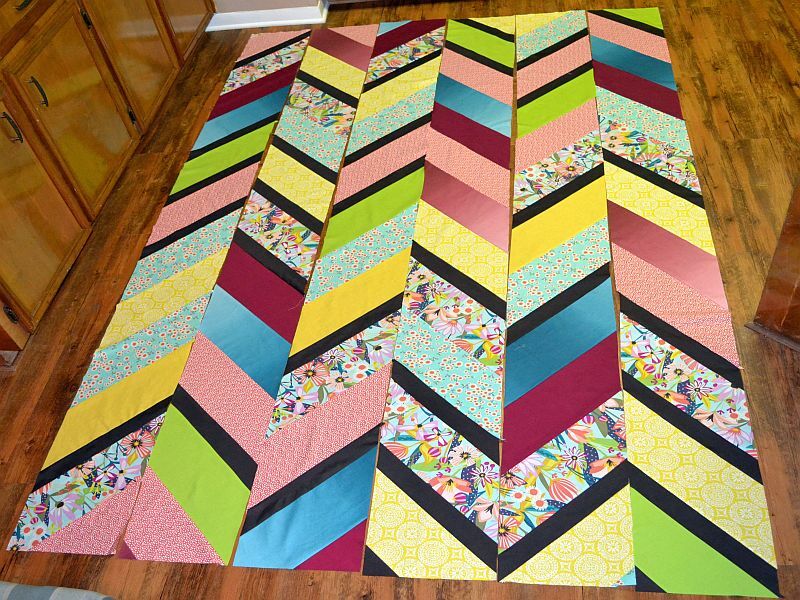 Once I had all my chevron columns prepared, I needed to decide on a final layout for my quilt. Preparing the columns was so easy. 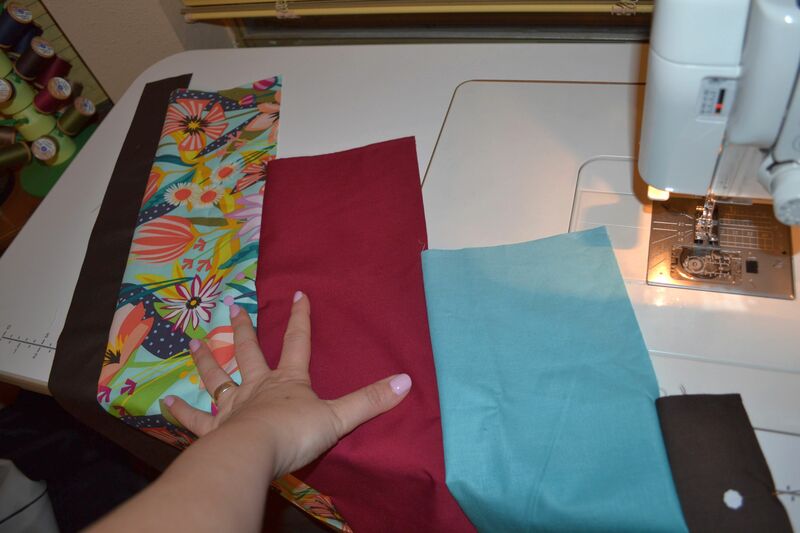 There’s some cool steps involved that save fabric and give great results. Next, I stitched the narrow strips in between and around the columns. I love how this quilt top turned out! BUT, I was relieved to see that Nancy included a lot of helpful illustrations and instructions to help newbie quilters like myself get this job done and done WELL! I’m looking forward to finishing this and improving my skills in the process. 09/05/14 Quilt Taffy and Simple Simon & Co. 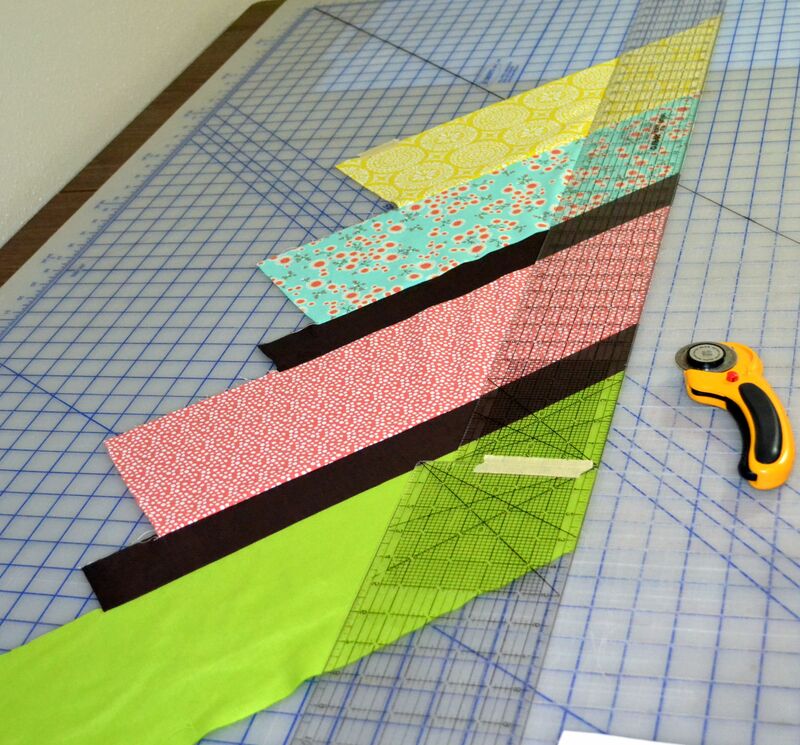 This entry was posted in Good Books I've Found!, Quilting and tagged Easy Quilts, Nancy Zieman blog tour, Quick Column Quilts on September 6, 2014 by Jenny Gabriel. Hello everyone! Thank you so much for stopping by! I’m Jenny Gabriel alter ego: StitchinJenny and I’ve mostly been a sewing educator for the past several years. I’m now a full-time member of the sales team at Humble Sewing Center/SewVac Outlet and I get to be their blogger when I’m not teaching or on the sales floor. Today is such a special day because, I get to participate in Nancy Zieman’s Book Launch Blog Tour! I’ll be sharing a little bit about her autobiography and how she is a true inspiration to me. I think it’s wonderful that Nancy is a long distance mentor to so many of us! Here’s the cover of her new book! At the end of this post you will find links & details to allow you participate in Nancy’s book giveaway (YES! You could win a free copy of her book!) and also see what other bloggers are posting along this tour. I’d like to have all of you pretend for a moment that you are reading over Nancy’s shoulder as she reads the following note…. Thank you Nancy for writing this transparent book about your life, struggles with low self esteem, and victories of reaping the rewards of your hard work and perseverance. It delights my heart that your greatest joy is “helping others to gain the confidence to achieve in the face of challenge.” I believe your book is fulfilling that goal in exponential ways! This quote perfectly captures the true spirit of being an over comer. It holds a special significance for me because of how it applies to myself and some very special people in my life. You see, I started a non-profit organization to facilitate teaching sewing to underage survivors of human trafficking. I get to work with them face to face and sometimes I even catch a glimpse of their self-confidence growing right before my eyes. I thank you because, many aspects of your story are an encouragement to me to persevere in my efforts with these girls. In your book, you mentioned that sewing became an outlet for you to build your confidence and affirm your worth. I’m hoping to repeat that success story with these young ladies. Thank you for your openness as you shared your insights into the painful topic of overcoming low self-esteem and how certain people really helped you with this. What great ladies! They are such good examples of the kind of parent and role model that I want to be. Thanks for sharing about the difference they made in your life. In closing, I just want to tell you that I think you are amazing in so many wonderful ways! Thank you for being you and for your excellence at doing what you do! Want to win a free copy of Nancy’s book? Readers must comment on Nancy’s February 4th Seams Unlikely Blog Tour Posting to qualify for book giveaways. This entry was posted in Good Books I've Found!, Product Reviews and tagged Nancy Zieman, Seams Unlikely on February 15, 2014 by Jenny Gabriel. Hello! Thank you for stopping by! This post includes a tutorial with tips on doing applique and embroidery on a tricky item such as a towel. For those of you who like to jump to the punch line, here’s some photos of the finished towels that were completed during our MONTHLY machine embroidery club at Humble Sewing Center. It’s been a while since I’ve written up a tutorial so, I’m feeling kind of rusty here! Below you will see a step by step list of “How To’s” and I’ll include a photo whenever possible. 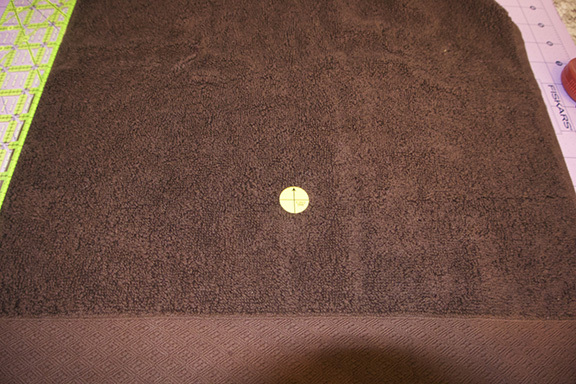 Find and mark the center of your towel. I use a straight pin to mark my spot. 2. Lay the towel open and (if possible) use a template to help you decide where to place your design. I used a software called Monogram Works to print a template with a cross hair in the design’s center. I cut a hole out of the center of the template so I could mark the towel with a fabric marking pen. 4. Next, lay the towel upon the hoop and apply gentle pressure to make it stick to the hooped stabilizer. 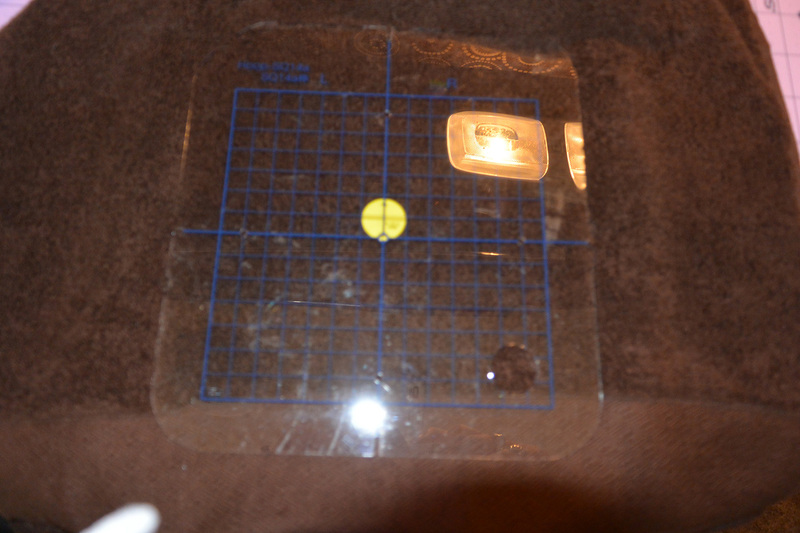 I like to use the plastic template grid that came with my embroidery machine to help me line things up in the hoop. Believe it or not, there’s a hoop hiding under that towel! 6. At this time I will show you the next steps of this particular design in a brief series of noted photos. Tip: Be sure to lay a piece of water soluble topper on TOP of the towel before you begin embroidering a design onto a towel. The topper keeps the embroidery threads from sinking into the towel and disappearing as well as preventing the towel loops from getting entangled in your needle and embroidery foot. The topper is then torn away and also rinsed away as needed. 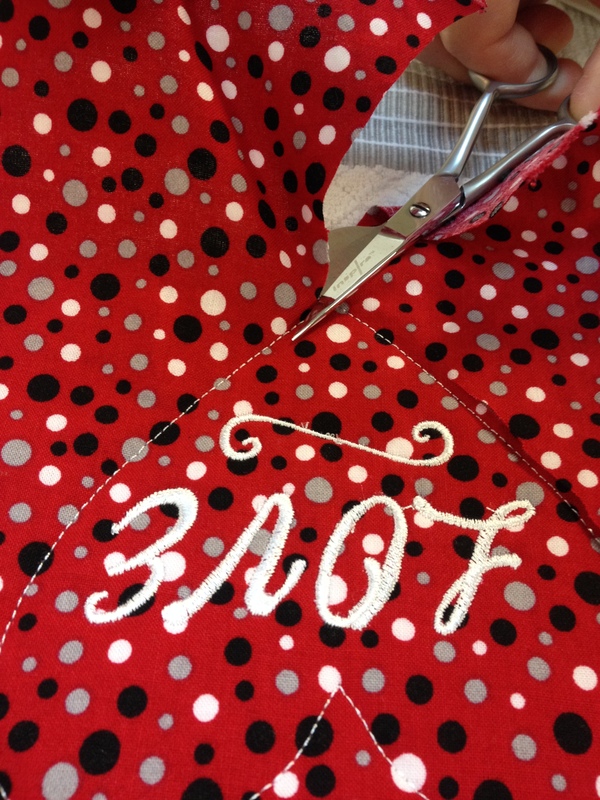 The tack-down stitch for this heart shaped applique has been stitched and the word Love & decorative swirl has also been stitched before trimming away the excess fabric. We removed the embroidery hoop from the machine but we did not remove the towel from the hoop. 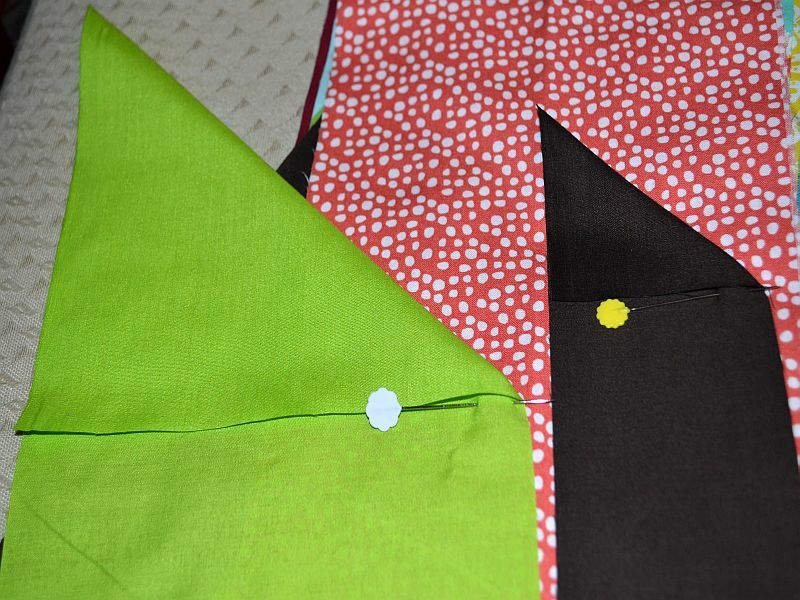 We then used duck-billed applique scissors to trim away the excess fabric. 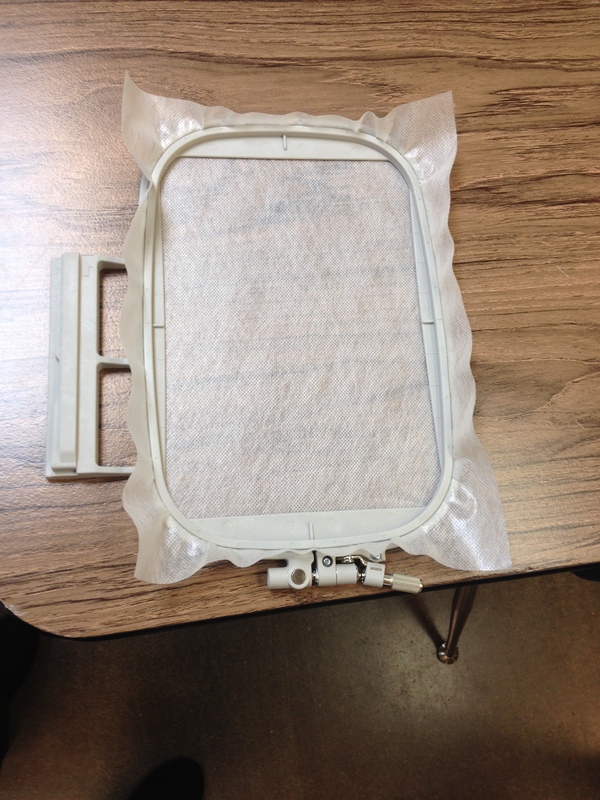 Next, we returned the hoop to the machine and placed a layer of water soluble topper on top of the towel. 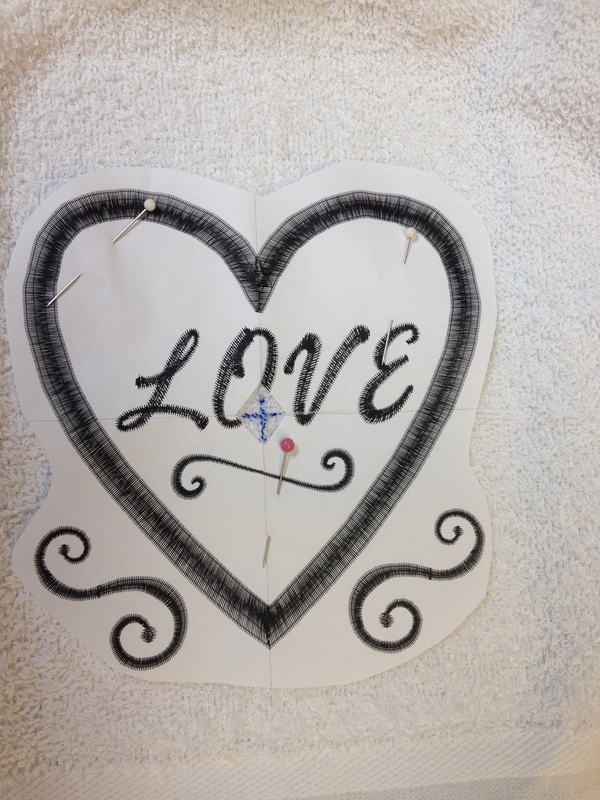 We resumed stitching out the design. Here’s a picture of a finished design with the topper still in place. Here’s Cheryl, tearing away the topper…. what a great job! When the design is completely done stitching, remove the hoop from the machine and peel the towel away from the stabilizer. Turn the hoop over and cut the excess stabilizer away from the towel. This will rinse away the first time you wash the towel. 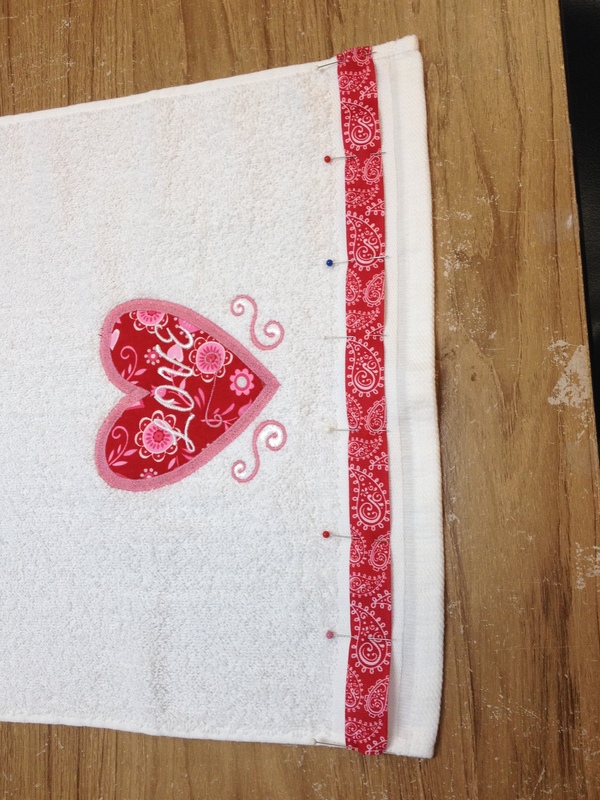 Lastly, pin and stitch a decorative trim or ribbon to the bottom of your towel. Yvonne used a pre-ruffled ribbon and chose a contrast thread and triple zig-zag stitch to attach hers. Cute right?! Thanks so much for reading my post! Have a great time on your next project and hope to see you soon! This entry was posted in Embroidery Club Projects, Machine Embroidery FYI and tagged applique tutorial on January 20, 2014 by Jenny Gabriel. Bling and Embroidery… What a combination! Today, I wanted to make a couple of new samples for the store. I’ve been quilting so much lately that I decided it would be a good idea to try something new. Since embroidery has always been a favorite of mine, I decided to monogram a tote bag. 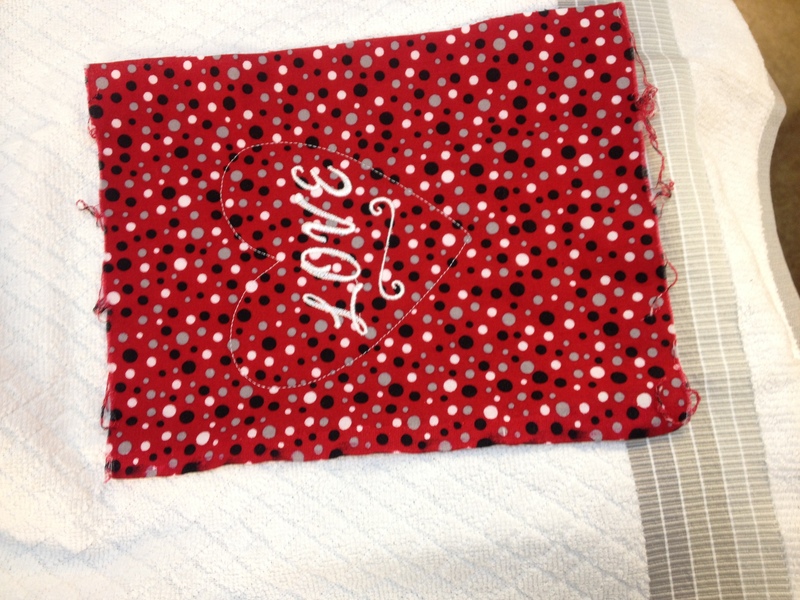 We have some really nice tote bag blanks in the store that make great items to embroider. 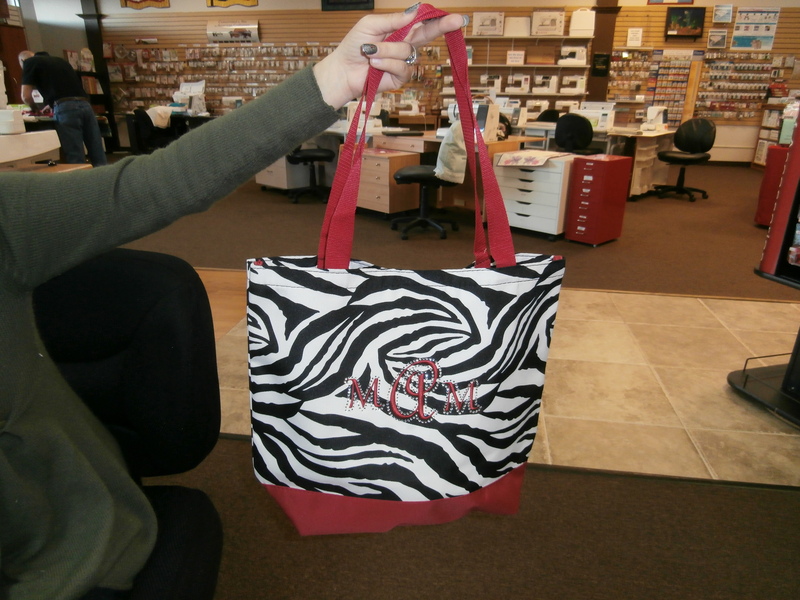 I selected one with a zebra print and red trim. Red is my favorite color. Since I have what I consider hard to monogram initials, MMA. Not because embroidering the monogram is hard but because the letters are not always the best looking in many fonts. A’s are often funny looking and the M is usually so wide that it doesn’t fit well with other letters. After trying many fonts, I decided on Curlz MT. The A looks like a cursive A with nice curves. The M is not overly wide and works well with the A. With that decision out of the way, I decided to digitize my monogram using Masterworks III. Masterworks has 156 built in fonts. Any number of which would work well for my tote bag, but it was a reason to digitize my own. 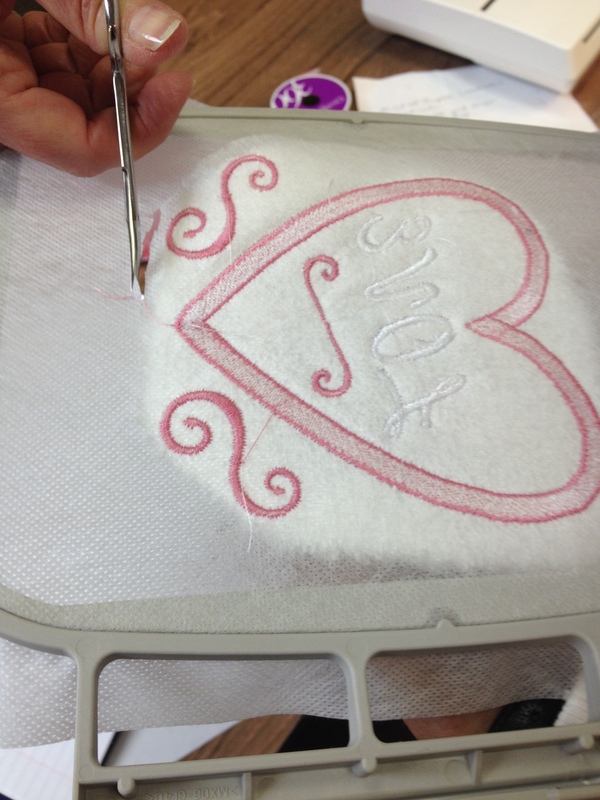 One of my future blogs will be on how to digitize true type fonts for perfect embroidered lettering. With the digitizing complete, I embroidered the bag matching the tread color to the bottom of the bag. The monogrammed tote looked great. But since Bling is my second favorite embellishment, I used the Artistic Crystal Software to add come Bling around my monogram. In the Artistic Crystal software, it is very easy to open an embroidery design and using the autoborder tool create a border around each letter 2 mm from the edge of the embroidery. Next, you assign crystals to the line and make any adjustments so that no crystals overlap. Then, it is off to the Silhouette cutter which cuts a crystal template. 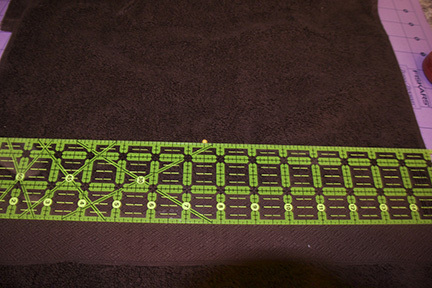 Once that is finished, the template is pulled off of the cutting mat, and placed on a backing board. From there, the template is placed into a tray, the crystals are poured on top and a brush is used to move the crystals into the holes. When the holes are filled, transfer tape is place on top. Brushing on top of the tape causes the crystals to stick to the tape lifting them from the template when the tape is removed. Now it is off to the press. 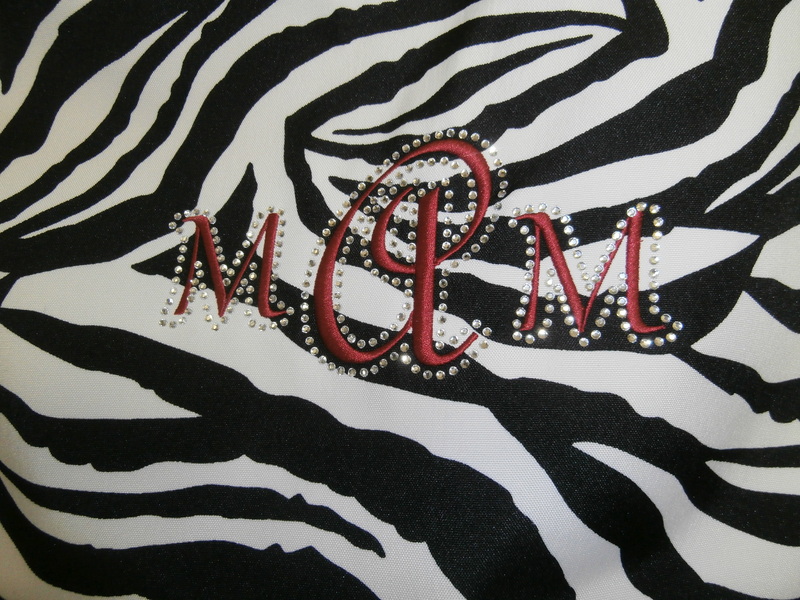 With the monogrammed bag in hand, I carefully placed the transfer take on top of the embroidered monogram lining it us so that crystals outline the letters. Then press for about 45 seconds using a pressing cloth on top. Try to remove the transfer tape, if the crystals lift up, press again. Do this until the tape lifts off with all crystals remaining on the tote bag. Using the pressing cloth again on top of the crystals, press one more time. Let the bag cool. Then brush your hands over the crystals, they should stay in place. In the end, I liked the bag so much that I bought it and made another for the store sample. Finished. The tote bag looks awesome. 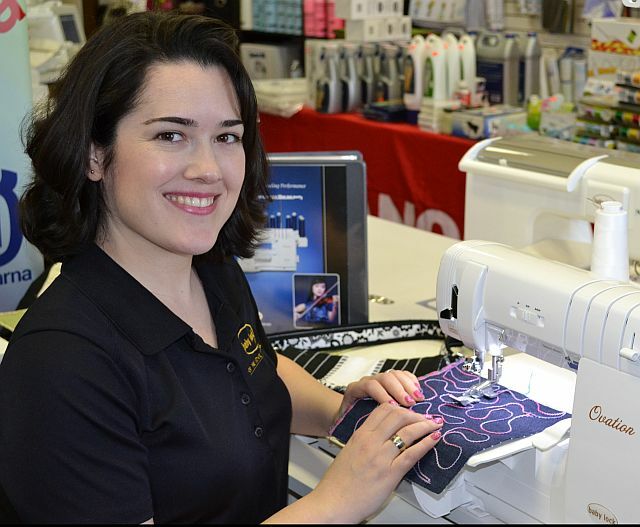 Stop by the store to see a demo on how you can add embroidery and/or bling to your life. You will never be the same once you do. This entry was posted in Bling, Machine Embroidery FYI, Tips/Techniques FYI and tagged artistic sewing suite, bling, Crystal, embroidery on January 16, 2013 by Designs by Marje.